Though Prabhupada was present for only the first eleven years of ISKCON’s fifty-year history, he continues to guide and inspire his followers to expand what he began. Yama, maybe you want to deal with this opening some other way, rather than as an extract. Italics maybe. But it might be a little long for that. Or maybe just separation from the next paragraph. Then you could use a dropcap. If it’s not an extract, then it needs opening and closing quotation marks, and the internal quotation marks need to be made single. It’s an astonishing story. If someone told you a story like this, you wouldn’t believe it. Here’s this person, he’s seventy years old, he’s going to a country where he’s never been before, he doesn’t know anybody there, he has no money, has no contacts. He has none of the things, you would say, that make for success. He’s going to recruit people not on any systematic basis, but just picking up whomever he comes across and he’s going to give them responsibility for organizing a worldwide movement. You’d say, “What kind of program is that?” There are precedents perhaps. Jesus of Nazareth went around saying, “Come follow me. Drop your nets, or leave your tax collecting, and come with me and be my disciple.” But in his case, he wasn’t an old man in a strange society dealing with people whose backgrounds were totally different from his own. He was dealing with his own community. Bhaktivedanta Swami’s achievement, then, must be seen as unique. This astonishing story has continued for many decades after Hopkins’s insightful observation, made in the early 1980s, though of course not at the same dramatic scale or pace. In this article I will try to document how the legacy of bhakti-yoga that Srila Prabhupada brought to the world is continuing and expanding even now. Srila Prabhupada wanted to share his love for Krishna with the whole world, and to fulfill that divine aspiration, he urged his followers to distribute more and more books, build more and more temples, and inspire more and more people to take to the practice of bhakti-yoga. Therefore, the movement he started, popularly known as the Hare Krishna movement, has often used success in these activities as its definition of success. And rightly so, because these activities have been and will continue to be pivotal in shaping the movement’s composition, outreach, and trajectory. But the movement often gets reduced to these highly visible activities alone, and much has already been written on them. Therefore I will dwell on other ways in which the bhakti legacy moves on. I will not attempt a comprehensive analysis of the entire movement, a task best left to a historian. Nor do I claim that my examples of ongoing legacy are the most important or the most representative; these are just the examples that strike me from my limited perspective as a secondgeneration Indian member of the movement. Perhaps the single most striking feature of the Hare Krishna movement’s history is its shift from a temple-based movement to a congregation-based one. The word congregation conventionally refers to any group of people who come together, including for religious purposes. Within the ISKCON lexicon, however, it generally refers to people who worship at the temple but live independently, outside the temple management structure. Though the term congregation member is not used uniformly throughout the ISKCON world, when I use it here I’m referring to both initiated devotees and people who have not yet made that commitment. ISKCON started in America and then spread to other countries, mainly in the Western world. Its devotional culture was so utterly different from mainstream Western culture that devotees felt the only way they could practice their adopted spiritual culture was by moving into the temple, which offered a safe haven from the materialistic outside world. Predictably, many of the movement’s early members were renunciants. Even many married couples, sometimes with children, lived and served in the temple, which provided for their basic needs. But as the years passed, most devotees found their initial zeal of having joined an exotic movement cooling down. And more and more devotees got married, started families, and pursued careers, thus leaving the temple environment. For its first decade or so, more than ninety percent of ISKCON’s members lived in the temple. Now more than ninety percent of its members live outside. 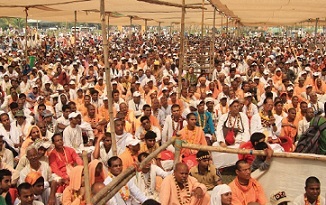 Among some of the movement’s leaders, this dramatic shift in demography initially caused some concern that ISKCON’s spiritual standards would be diluted. But what emerged was not so much dilution as consolidation – the movement became stabler as devotees settled to a level of practice they could sustain throughout their lives. Indeed, dedicated congregation members now manage temples. They also occupy the highest ecclesiastical positions in the movement, including those of gurus and Governing Body Commission (GBC) members. As the composition of the movement has changed from temple-supported renunciants (including families) to financially independent householders, its mode of interaction with the world has changed from renunciation to penetration. In its first few decades, dhoti- or sariclad devotees dancing and distributing literature were the movement’s defining face. They exist even now, but they no longer represent the movement’s cross-section. The well-educated, influential professional is as much integral to the movement as to modern society. The tech-savvy colleague in the office may well be a Hare Krishna , a modern bhakti-yogi who has both penetrated into and integrated with the mainstream culture. According to individual nature and commitment, each member performs a delicate dance of balance between tradition and modernity. Srila Prabhupada emphasized that devotees should systematically study the Vedic scriptures he translated and commented on. Such study would deepen their philosophical conviction and fine-tune their spiritual practices. Accordingly, ISKCON temples diligently conduct a daily morning class on the sacred Srimad-Bhagavatam. Additionally, ISKCON has come up with programs for systematic scriptural study catering to all its members, from newcomers to seasoned practitioners. Most centers periodically conduct introductory courses on the Bhagavad-gita that give newcomers an overall grasp of its coherence and relevance. For regular practitioners, many temples and educational centers offer the Bhakti-sastri course, which provides progressive study of the movement’s essential literature. Thousands of students all over the world have availed themselves of the course, the teaching of which is supervised by the ISKCON Board of Education. Additionally, many devotee communities have started schools to provide their children with a holistic education that teaches not just material knowledge and skills that secular schools offer but also spiritual wisdom and values that the tradition offers. Further, for youth studying in universities, several temples have started customized youth centers near colleges. These centers provide students havens for community and spirituality where they can destress from the academic tension of their competitive careers. The movement has developed other community-support systems as well. ISKCON has been at the forefront in reaching out to the larger community through its extensive food-relief programs. Hare Krishna Food for Life is the world’s largest vegetarian foodrelief organization. With projects in over 60 countries, it provides more than 1.5 million free meals daily, including in disaster areas in various parts of the world. 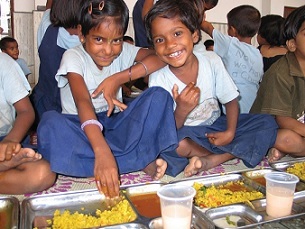 The Indian wing of this initiative, ISKCON Food Relief Foundation, runs a Mid-day Meal program, providing nutritious and delicious Krishna -prasada every school day to over 1.2 million students from all backgrounds. To provide philosophical and practical guidance to members, devotee communities in various parts of the world have developed devotee-care systems, such as the counselor system. To help devotees find compatible spouses, leaders of several devotee-communities have set up marriage boards and other matrimonial portals, physical and digital. To help train talented and dedicated young devotees to take up the mantle of the movement’s leadership and thereby enable a smooth succession from one generation of leaders to the next, various leadership-training forums have also been established. Devotee professionals have also set up hospitals and hospices. The bhakti tradition places great importance on departing from the world in a spiritually conducive circumstance and consciousness. Accordingly, devotees have set up a hospice in the holy land of Vrindavan, where committed practitioners can prepare to face life’s final exam – death – in a setting that is medically and spiritually favorable. As the body takes its inevitable course towards destruction, the soul takes its conscientious course towards spiritual elevation, if not liberation. Similar hospices are planned for other places, including Mayapur, West Bengal, home to the movement’s world headquarters. Srila Prabhupada repeatedly stressed the principle of simple living and high thinking, and he wanted to demonstrate it through self-sufficient communities that featured God-centered ecofriendly living. In his cutting critique of materialistic civilization’s reckless encroachment on nature, Srila Prabhupada proved prescient. Over the last four decades since Prabhupada’s critique, many studies have shown how indiscriminate exploitation of the environment has jeopardized the future of humanity, indeed of the earth itself. As the world is becoming increasingly aware of the staggering ecological and economic costs of our past centuries of environmental exploitation, green consciousness is rising. Bhaktiyoga takes this ascent of human consciousness towards its zenith in Krishna consciousness, which re-envisions the universe as a cosmic family, with God as the father, nature as the mother, and all living beings – not just human beings – as children. This inclusive vision provides an additional impetus towards raising eco-awareness – vegetarianism. Studies have shown that producing and consuming nonvegetarian food harms the ecology much more than the pollution from all the world’s vehicles. ISKCON has been a global pioneer in spreading vegetarianism, especially in the West. This pioneering is philosophical, offering a more spiritual and dignified conception of our nonhuman brothers and sisters. But it is also practical. Through many outlets, ISKCON provides an array of delectable vegetarian dishes of Krishna -prasada to a world that mistakenly equates vegetarianism with a diet of vegetables alone. Besides contributing to the mainstreaming of vegetarianism, ISKCON in various parts of the world has developed eco-friendly communities that subsist on, as Srila Prabhupada would say, “the land, the cow, and Krishna .” Initially these communities tried to avoid all modern things, but in time each arrived at its own balance, using nature’s resources and modern amenities. Today many of these communities serve as not just serene spiritual sanctuaries but also as crucibles of ecological research. They demonstrate that prosperity achieved by living in harmony with nature is a viable, even preferable, alternative to prosperity by exploiting nature. No movement can exist in a social vacuum, oblivious to the intellectual and cultural trends of the larger society of which it is a part. A major place where such trends are understood is the academy, its study of religion being especially relevant to religious organizations. The academy significantly shapes public perceptions of a religion, especially where it is a minority religion and so, for the mainstream society, is more learned about than lived. This principle was relevant to ISKCON in the Western world, where the bhakti culture ubiquitous in traditional India was seen as utterly foreign, if not incomprehensibly alien. To help correct such perceptions, some devotee intellectuals felt inspired to enter the academy to gain formal training to respectably present the tradition’s voice in today’s multicultural milieu. Such an outreach of the tradition to the academy has important precedents. Srila Bhaktisiddhanta Sarasvati Thakura, the spiritual master of Srila Prabhupada, sent one of his scholarly disciples, Sambidananda Dasa, to London to write his doctoral thesis on the history and literature of the Gaudiya Vaisnavas. Religious traditionalists often find the academy’s approach to studying religion distressingly unsympathetic to insider perspectives. The output of academic study can sometimes be summed in the epitaph “Operation successful, patient dead.” Yet discerning traditionalists know that the academy will continue to shape how the public perceives the tradition. Scholars are often not privy to insider perspectives. Therefore, if public perception is to reasonably reflect the reality of the tradition’s contributions, the onus falls on insiders to academically train themselves to present the insider perspective in a way intelligible to the outsider. The late Tamala Krishna Gosvami, one of the movement’s most prominent leaders and a sannyasi and guru, gave a major boost to the tradition’s academic penetration by entering the academy and writing a seminal thesis on Srila Prabhupada’s theological contributions. Other devotee scholars have written defining books on the modernday leaders of the tradition – Bhaktisiddhanta Sarasvati Thakura and Bhaktivinoda Thakura – and on the foundational books of the tradition, namely the Bhagavadgita and the Srimad-Bhagavatam. Satyaraja Dasa has founded the Journal of Vaisnava Studies, now a major voice in the deep study of the Vaisnava tradition. 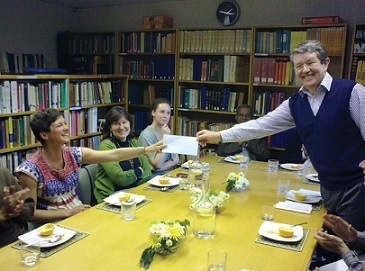 Devotee scholars joined hands with the broader Hindu community to set up the Oxford Center for Hindu Studies (OCHS) at Oxford to create a vibrant example of contemporary scholarship. In an academy shaped by Abrahamic stereotypes of religion and dominated by nondualist perceptions of Hinduism, devotee scholars have done pioneering work in ensuring that insider perspectives and the bhakti tradition are given their due place in the academic study of Hinduism. Of course, the legacy of love that is the bhakti tradition continues most vibrantly beyond the external structures and systems. It lies in the hearts of the thousands of practitioners for whom Krishna becomes an increasingly intimate reality through their daily devotional and meditational practices. And as they resourcefully share that reality with others, they provide serenity amid anxiety, spirituality amid materialism, and purposefulness amid pointlessness. Caitanya Carana Dasa, a disciple of His Holiness Radhanath Swami, holds a degree in electronic and telecommunications engineering and serves full time at ISKCON Mumbai. He is a BTG associate editor and the author of sixteen books. To read his other articles or to receive his daily reflection on the Bhagavad-gita, “Gita- Daily,” visit thespiritualscientist.com.